Bach Festival at the JUNOS! What an incredible year this is turning out to be for the Bach Music Festival of Canada. I am extremely delighted to announce that the Festival is going to the 2012 JUNO Awards in Ottawa Canada! We are delighted to be partners with the the Canadian Music Centre, the National Arts Centre, as well as the major record labels in presenting the Classical Music Showcase. 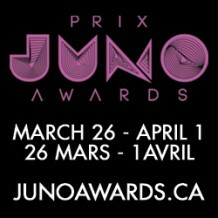 Friday March 30th, the official Opening Day of the JUNO Awards, with a 3:30pm Showcase scheduled at the National Arts Centre! Throughout the entire weekend, I will be blogging of the experience – the Classical Music Showcase, the Official Welcoming Reception, the JUNO Gala Dinner and Awards Night, and the Scotiabank Place live Broadcast event called the Red Carpet at the JUNOS hosted by William Shatner. The blog will appear here, as well as on facebook and through numerous media outlets including the Exeter Times Advocate and the Beat Magazine. Will you be in Ottawa? If so, please join the Bach Music Festival of Canada Board of Directors, Artistic Director Gerald Fagan and myself, as we join in the celebration of the Classical Music industry in Canada at the Classical Music Showcase. If you are not in Ottawa this weekend, then join us through this site and others, to share the experience. See you at the JUNOS! Next post2012 JUNO Awards – Let the Games Begin!